Once visitors are here, they will find Albuquerque is best experienced by car. The Alvarado Transportation Center, located Downtown, is Albuquerque&apos;s transportation hub, directing both train and bus travel. Interstates 25 and 40 are Albuquerque’s major thoroughfares, intersecting in the middle of the city. 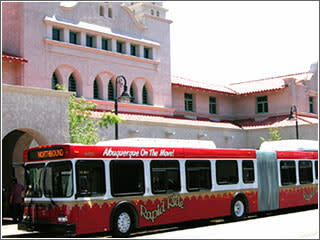 ABQ Ride is the City of Albuquerque’s public transportation service and provides rapid transit and local bus service as well as paratransit service with Sun Van. Beginning in 2018, Albuquerque will offer Rapid Transit (ART) between Nob Hill, Downtown, and Old Town.